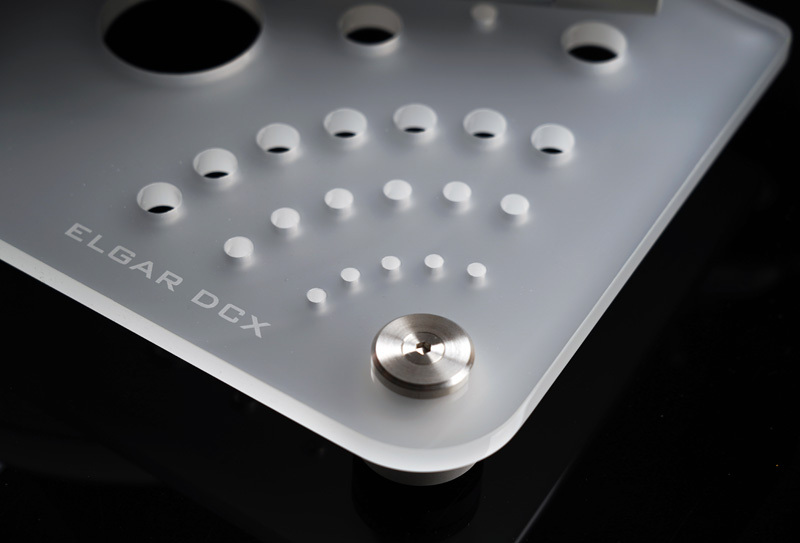 Acrylic made isolation platform, e-base, is tailor designed for the Elgar DCX turntable exclusively. 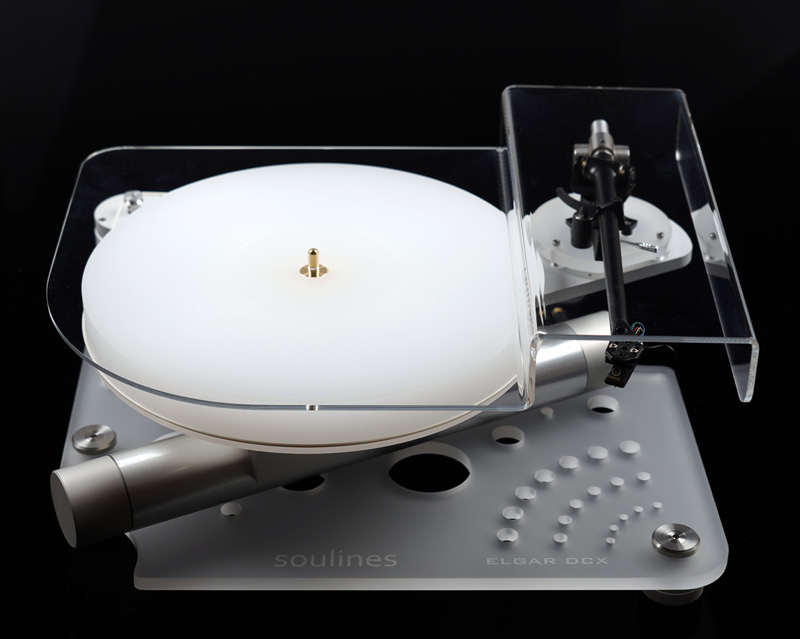 It provides a good base for the turntable, preventing structure born vibrations coming from the surrounding environment to enter the turntable itself and allows easy leveling of the Elgar DCX. 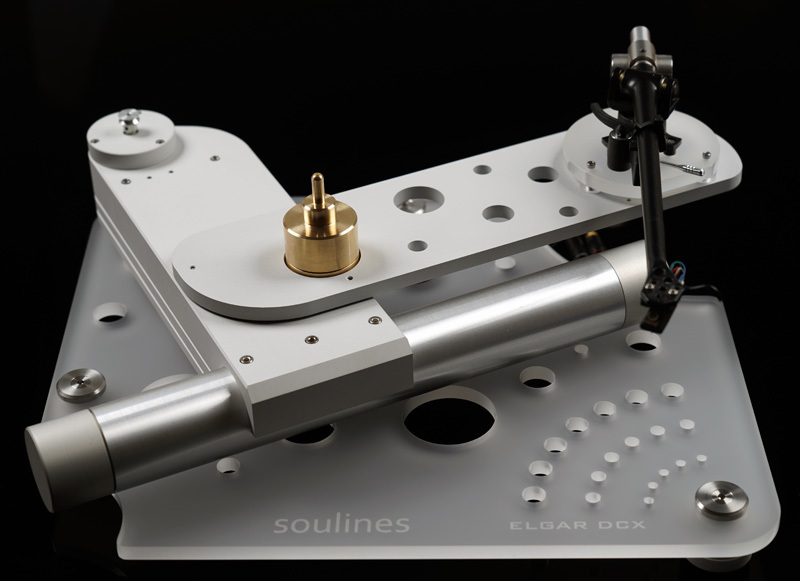 Incorporating curved cut-out at the left-front corner its allows easy access to the turntable OFF/33/45 switch at the left side of the massive horizontal aluminum tube. It contributes to the interesting look of the unit, improving its elegant visual appearance even further. Platform base plate is made of solid 10mm thick Acrylic with polished edges and strategically drilled with the holes of different diameters, where the plan and size of holes follow the Fibonacci sequence and Golden Section ratio rules in order to damp all the turntable born surplus vibrations evenly, across the wide frequency range. 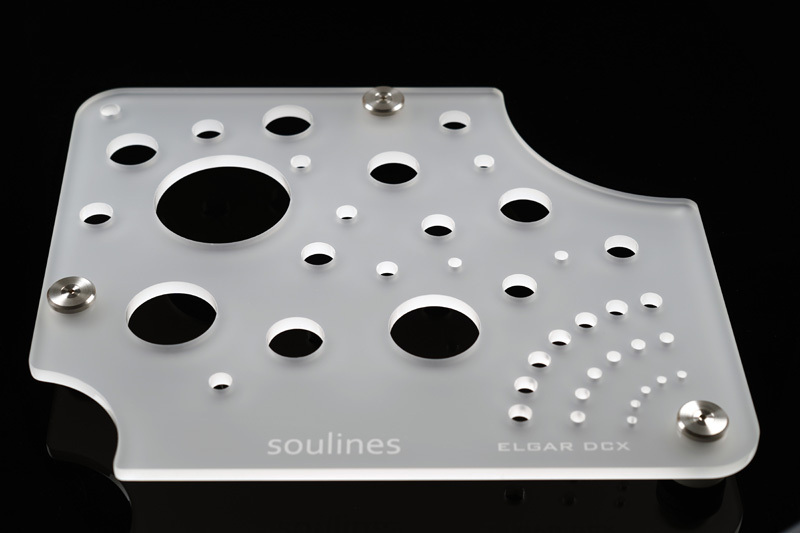 Platform base plate is of medium weight relative to its size, thus energy storage is optimal. 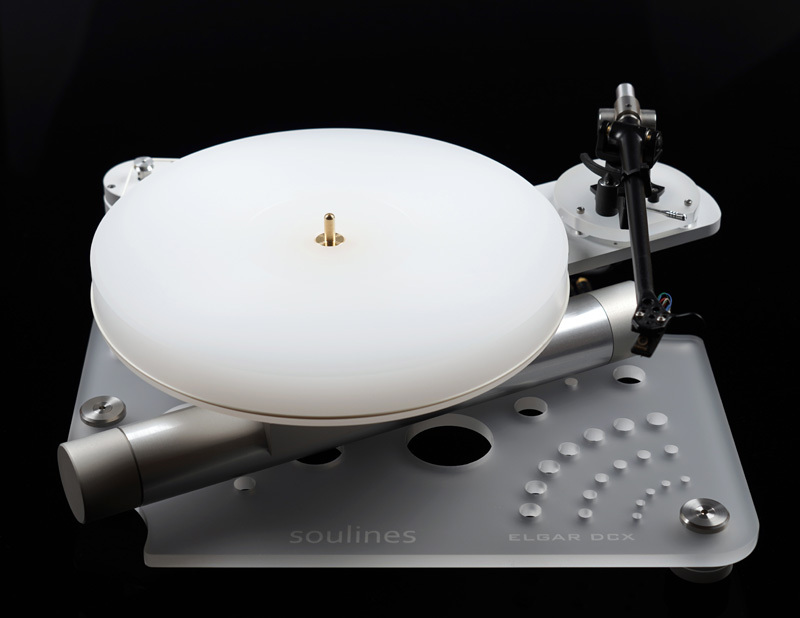 Structure born vibrations coming from the surrounding environment are prevented from entering the platform base plate and the turntable itself employing three isolation cones-feet, which are in contact with the base plate only over the rubber-cork washers of different diameter, kind of a "soft" coupling. Cones are made of solid aluminum and have a small silicone pucks on the bottom providing further isolation from the shelf/rack/stand on which the platform is rest on. 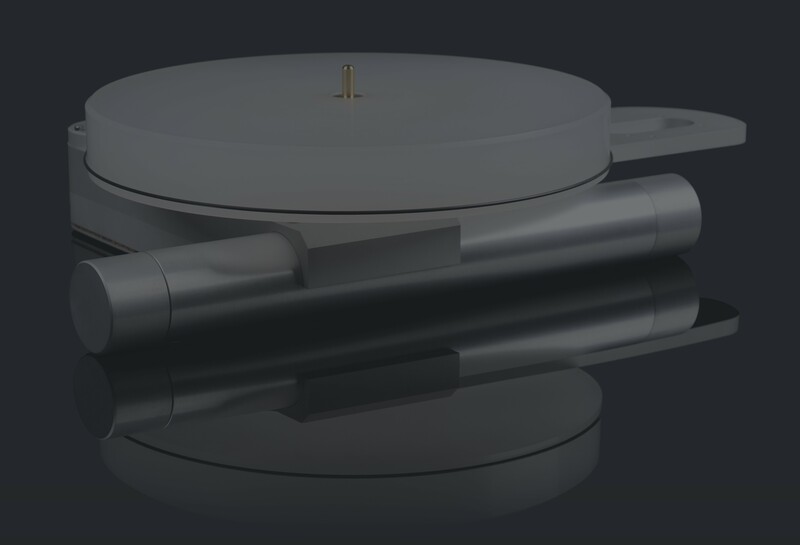 Cones are height adjustable, allowing easy leveling of the platform.